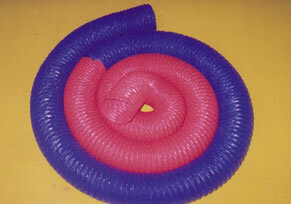 Pik India is a esteemed organisation who has been in the line of manufacturing Hoses PVC Since 1978. Acknowledged as the pioneer in non-tyre product innovation and is prime supplier to Defence, Industrial, Automotive and Consumer Markets. 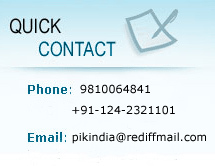 Pik India manufacture the widest range of ducts hoses for Mineral, fuel oil, Steam, Air, Gas, Water and other liquids and fluids and manufacture other pvc hose tube and pipe for numerous Industries as per their design and specifications. "M1 SPECIFICATION OF PVC HOSES ARE ALSO MANUFACTURE / SUPPLY ON REQUEST". TYPE-PFFH : Flexible PVC Hose made with continuous Spring Steel Wire reinforcement Helix between Polyester Fabric Coated with PVC on both sides.